You could practically hear the groans echoing through Cardinals Nation when the MLB Network graphic popped on screen for the team’s first pick in Monday’s draft. The selection, at No. 19 overall, was Texas A&M right-handed pitcher Michael Wacha. 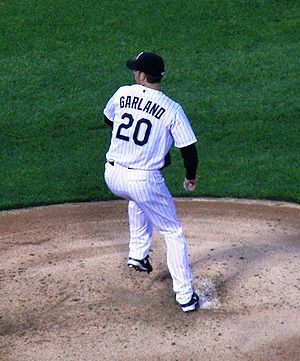 The comp listed for him by the MLBN broadcast was Jon Garland. Jon Garland? Oh, c’mon! The collective noses being turned up at the thought of such a pitcher were enough to smell some toasted ravs from a thousand miles away. And sure, I get it. When you think first-round pick, you think excitement, and when you think excitement, you don’t think Jon Garland. Garland, who last pitched for the Dodgers last season, had a power pitcher’s size at 6-foot-6, 210 pounds, but not a power pitcher’s arsenal. He was a sinkerball guy whose fastball topped out in the low 90s. In terms of performance, he made one All-Star team, won more than 14 games twice and posted an ERA below 4.00 in a full season twice. He struck out 4.9 batters per nine innings in his career. I can’t speak to the quality of the Garland comp for Wacha – that’s a whole different discussion, anyways – but let’s get one thing straight. If Wacha turns out to be a Garland clone, Cardinals fans not only shouldn’t be upset, they should be ecstatic. The amateur draft started in 1965. Of all the pitchers the Cardinals have selected and signed since then, there are six whose careers compare favorably to Garland’s. Six. Let that sink in. To expand the point a bit beyond Garland and Wacha, the expectations people have of draft picks are so far out of whack. Go and look at how few picks, even in the first few rounds, contribute positive value at the Major League level. So even when a first-rounder (James Ramsey) is compared with a scraptastic utility man (Skip Schumaker), it can’t be taken as the slight most would perceive. Yes, you’d hope the organization is aiming higher with top picks. But no, it isn’t likely to succeed at it. In the history of the draft, the Cardinals have selected 42 players, or less than one per year, who have gone on to rack up at least 10 bWAR. We’ll call that “Da Meat Hook Line,” in honor of Dmitri Young (10.1 bWAR). And that 42 includes players the club didn’t even sign (Hello, Paul Molitor, Class of 1974). There is so much that can go wrong and so little we know about how to predict prospect performance. So when it comes to the draft and Michael Wacha, all I can say is hope for a Dan Haren, prepare for a Chris Lambert and accept Jon Garland as a wonderful outcome.